Addie Lee and Olivia went to Shreveport to have their photos taken by the greatest photographer, Nicole Colvin. She was so kind to spend her Black Friday chasing two little girls. The link to her blog is on my blog list under Nicole Colvin Photography (I can't get the link to work by posting it)...she always gives us a sneak peak! I can't wait to see the rest! We've been home since Saturday and everything is going well. I'll post some pics soon! We also got a visit from John Hinton last night! He is a cutie pie and is so sweet. 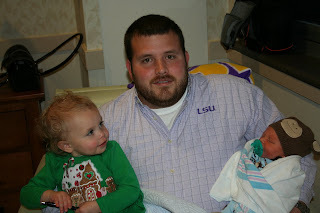 Addie Lee loved on both of the guys (maybe we should get worried if she's doing this loving so early!). I think she liked being the big girl. I know she will teach the guys many things in the coming months. We took some pics so I will post soon! 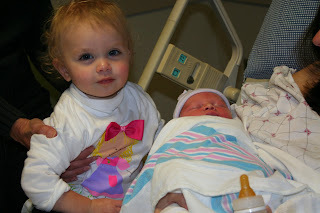 Kimber Todd Morris came into this world with a grand entrance on Thursday, December 3, 2009 at 9:47 a.m. 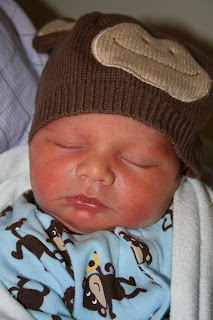 He gave us quite a scare...I went to the hospital on Wednesday because I was having contractions 3 minutes apart. Since I had contractions for the past week, we decided to induce on Thursday. At 6 a.m. on Thursday the nurse started the drip and my contractions got pretty bad, so I got my epidural and things seemed to be settling down. That was clearly wrong! At 9:30 Dr. L came in and broke my water. Kimber's heartrate had been around 130-160 all morning. However, when the doctor broke my water his heartrate dropped to the 50s. 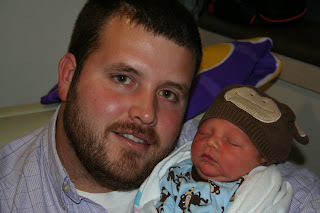 Dr. L said his cord and hand were leading out of the birth canal and that was not good. At this time, we were going to an emergency C-section. Swarms of nurses were by my side within seconds. 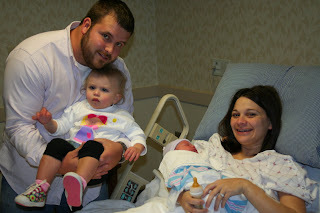 I was wheeled to the OR and Kimber was born within 7 minutes. This was a whirlwind and I was nervous and anxious to hear him, touch him, and see him. Kimber's first cry was the sweetest sound I have ever heard. This was the scariest thing I have ever been through in my life. By the grace of God, many prayers, and modern technology, Kimber was born healthy weighing 7 lbs 11 ounces, measuring 20 1/2 inches. We want to thank everyone for their prayers at that time.